Jake Hancock’s a private investigator so cool, you shouldn’t put your tongue anywhere near him. 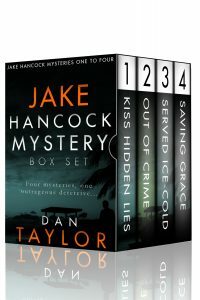 For a limited time, his first four mysteries are available to download as a box set for less than a dollar! That’s four laugh-out-loud, super-fast-paced books for around the price of a lettuce head, and that wouldn’t make you laugh even half as much. Dan Taylor is the author of the Jake Hancock comedic mystery series, Hilariously Sober blog, and other junk. He lives in Norway, where he was kidnapped to by a blond Norwegian national and forced at gunpoint to have babies with her. He requires no rescue mission.